before i get into the whole project life thing.. i just wanted to vent? type away endlessly & dump my brain? ya. maybe that's a better description. i've been blogging since 2006. that's 8 years. not consistently by any means. but that's a lot of blogging. i've run the gambit of blogging material... random thoughts, notes to my kids, vacation recaps, recipes, crafts, movie suggestions, scrapbooking, you name it. i'm not short on words. i never really have been. blogging was always therapeutic in a way. i'm not afraid to announce my shortcomings. i'm not proud of them, but acknowledging them out loud has always helped me find some sort of accountability to myself. i'm not afraid to talk about the bad stuff. it's life. i don't need anyone to think i live it a castle in the clouds. i'm down here in the trenches just like the rest of you. but somewhere, somehow, along the way, i lost my voice. i fell out of love with blogging. i'm almost certain it's when i tried to turn myself into a "crafting-mommy-blogger". i'm not a crafty mommy blogger. i'm lucky to get one project done a year. i'm sarcastic, i'm sappy, and i'm far from being able to crank out regular new, exciting, highly photographic recipes. it's not me. i found myself needing something to focus on the other 4 hours of the day i was juggling household duties & managing care of a newborn & 6 year old, and somehow, that became it. that's when i started the downward spiral into the blackhole that has now become my blog. add into that i started back to school, and we have the current state of a once monthly update. i wrote a thing for my grandmother's funeral service in may, and i wanted to share it here in this space, but not before i talked about this feeling of losing my voice. ya see, writing that little bit for her, it brought back all those memories of how much i loved to write, and share, even if no one was really reading. so anyways, you may see more of me around here, those of you that are still out there, anyways. right now though, i just want to share pretty pictures & my approach to project life for 2014. i'm practically done with 2013. just 2 weeks left, & just pictures to print out at that. it's a dump & run situation at this point, i just can't manage the interest to be all crafty with the christmas pictures. get them in, get the story down, and move on. last year, keeping up with a 12x12 album during school was tough. trying to get enough pictures, in the right orientation, and planning out the pages was a daunting task. i saw a lot of 6x8 albums circulating around, and while most of them were being compiled by people who were without kiddos, i was interested. i had my friend order me 3 studio calico handbooks (because we all know EVERYTHING studio calico eventually sells out, and i didn't want to end up half way through the year without matching albums) & started stock piling page protectors. 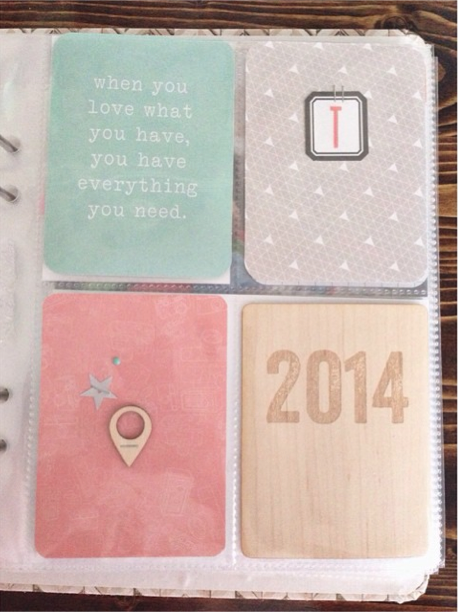 two weeks ago i finally got the chance to start printing out january 2014 & playing. i was instantly in love. the size was much more manageable, i could have the whole thing on the table in front of me while i worked, and not feel cramped. not only that, but as someone who can't seem to move past the scrapping-to-match-my-pictures phase, it was much easier to pull together spreads with cards & embellishments. i'm in the habit of using title cards to pull out & feature words that rance says, or phrases on repeat around the house. it's a fun way to get in those details that i don't always have a picture to go along with. this year, i lost the white borders as well. don't get me wrong. i like the white borders, and will probably find myself going back to them. but i needed a break. prepping my pictures for each month takes a heck of a lot less time now, and i really needed that chunk of time back to be productive in getting the album compiled. in a book is better than on a hard drive. something else i noticed as i was pulling together the first half of january, is that i felt better about using up pockets for play's sake. the past few years i've held every pocket as an opportunity to tell a story within the week. if i used that pocket for decoration, i missed a chance to tell a story. now, i can just push a story to another spread, & still play. it's making scrapbooking playful for me again. the other fun thing is that, so often i've left out personal details from MY life, because i wanted this to be 'OUR' story, but it's hard when i live in a house full of boys who are not necessarily interested in contributing.. and now, i'm putting them back in, because really, this is my story to, and this is me telling our story.. and i have unlimited monthly space, so why not? !